Since I started working for a VMware partner in March, I have slowly been building my home VMware lab. My most recent addition has been a new layer 3 switch. I needed layer 3 switching so I could setup VMware NSX in my home lab with multiple VLANs and fully test micro-segmentation. I made a quick list of requirements for what I was looking for in a switch before I went hunting. Enough ports to operate 3 or 4 hosts with 4 - 1GB NICs each and my Synology NAS 415+. After doing some research online, I decided on the Cisco SG300-28. It gave me the most ports possible and still remaining fan-less and meeting all of my other requirements. The price was right too, I caught a sale online and was able to purchase it for $318. That comes out to $11.35 per port. Not bad for all these features. 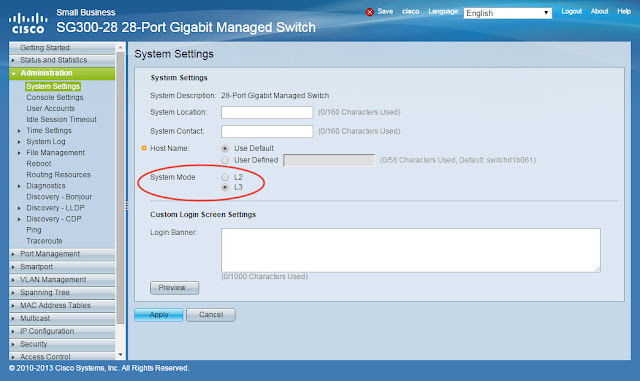 The switch has a CLI interface that is very similar to a Cisco Catalyst switch. It also comes with a nice GUI web interface for configuring it as well. So it keeps all admins happy. One big gotcha that I ran into right away is that by default layer 3 mode is disabled. Below is the setting in the web interface to enable layer 3. After getting the switch setup in layer 2 mode I went to enable layer 3 and this neat little warning comes up. As Lenny Pepperbottom would say How neat is that? 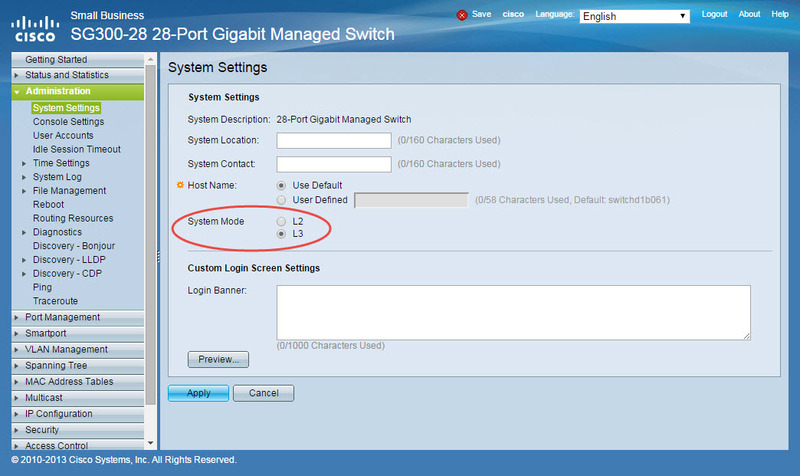 So, after configuring all of my settings enabling layer 3, this switch deletes your config and starts over from scratch. Great switch, but that's rather annoying. But it gave me extra practice on setting the switch up again. Next time I'll talk about how I enabled Link aggregation on my ESXi hosts and also enabled LACP on my Synology NAS array. I'm a big fan of using PowerShell in VMware systems management. Whenever I have a long repetitive task I look for a way to script it so I can speed up the process. I was working on some security auditing tasks and one of the requirements in the VMware hardening guide is to make sure that none of your VM Guests have any advanced settings that may be left over from VMware Workstation or VMware Fusion. VMware actually says that security conscience organizations should explicitly disable these settings. See VMware hardening recommendation here. In any environment it would take a long time to check every VM one at a time and look for all of these settings. I did some research and put together a few script that can check every guest VM and look for all of these settings and export the findings into a single .csv file to sort. This is a great tool to help you audit your enviroment, and provide proof to your security team. Disclaimer, I'm not an expert PowerShell coder. I'm sure there are more efficient ways to do this. Feel free to drop a comment on how to make this code better. All code is downloaded and used at your own risk. Be sure to understand what the code is doing. Below is the PowerShell script needed to run this audit. A few weeks ago I had a customer that implemented some new hardware into their VMware enviroment. They ran into some major problems with VMotion. Now your probably thinking they purchased some commodity hardware that was completely unsupported. Actually they purchased some brand new HP DL380 Gen 9 servers. All the components in this server are in the HCL. In fact the version of VMware that they were running is still fully supported by VMware. If you check the VMware HCL for a HP DL380 Gen 9 server you will see that it is supported for ESXi versions 5.1 - 6. My customer was running version ESXi 5.0. The customer was able to install version 5.0 and get it running without issue. Where they ran into problems was with VMware EVC mode and VMotion. EVC mode is a software solution for a hardware problem. Intel and AMD CPU's are constantly changing and adding new features and instruction sets with each new"family" or generation of CPU's. 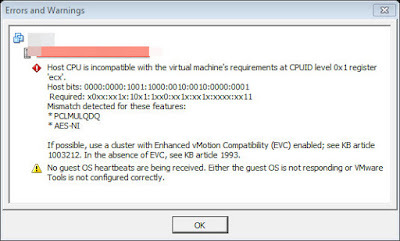 This is a problem for VMware Virtualization when you use VMotion. With VMotion all servers in a cluster must have the same exact CPU instruction sets available. If they don't and a VM guest is using a newer instruction set it will not be able to be moved to a older CPU without that doesn't have that feature. 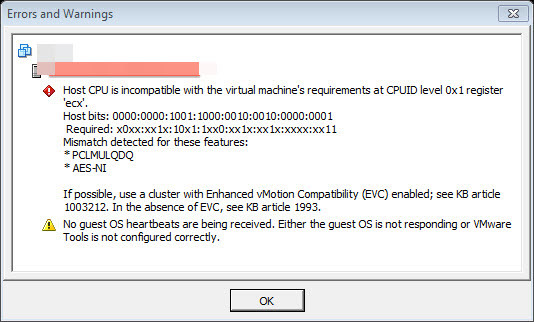 The solution that VMware came up with is EVC mode. Turning this feature on in your cluster "masks" or hides the instruction sets of the new CPU's and only allows the VM Guests to see instructions that are the same across all the hosts in a cluster. For my customer they were running one older HP DL380 Gen 8 server that had a Sandy Bridge Intel Processor. EVC mode was enabled and running as "Sandy Bridge Mode", however EVC mode in version 5.0 is not compatible with a new Intel Haswell processor. In fact older versions of EVC doesn't even know about the new instruction sets that are available in Haswell or Ivy Bridge. Because of this EVC didn't even know how to mask or hide them. With EVC mode enabled is seemed to work for a little while, but the customer learned that they could only VMotion from the Gen8 host to the Gen9 host, not the other way around. It was a one way trip. If they tried to move a VM guest from a new host to an old host, this Error occurred. After doing some research on the issue I checked the HCL for the Gen 9 HP server and discovered that it was not compatible with ESXi 5.0. So we proceeded to upgrade Virtual Center and the ESXi hosts to version 5.5. After completing the upgrade and enabling EVC mode in the cluster again. Along with a hand full of cold boots of VMware Guests, the issue was resolved. When your making any hardware changes, always check the HCL first. A history Lesson on compute virtualization.